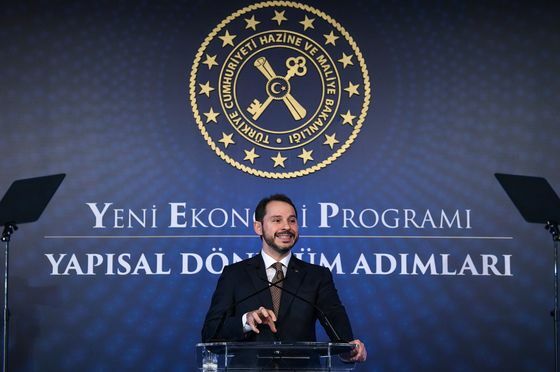 Turkey may already be on course to recovery after ending last year with two consecutive quarters of contraction following a currency crash, Albayrak said Monday, citing preliminary data through the first three months of 2019. He spoke after the government released statistics showing joblessness soaring, underscoring the economic challenges Turkey still faces. Contradicting widespread assumptions by investors, Albayrak said a liquidity shortage in the swaps market used to stabilize Turkey’s currency before last month’s elections wasn’t orchestrated by the government, which acted in line with “free-market rules.” Albayrak said Turkey wants to capitalize on an election-free period of more than four years following the March 31 municipal vote so economic policy makers can act without political pressure. Albayrak said he also discussed steel tariffs and the U.S. probe of Turkey’s state-run lender Halkbank with American officials, without elaborating. A senior Halbank executive was convicted in a New York court last year of participating in a scheme to evade U.S. sanctions on Iran. Investors have been bracing for a fine on the bank from the U.S. Treasury. But a continued weakness of domestic demand is weighing on Turkey’s growth prospects following last year’s depreciation of 28 percent in the currency. It showed signs of stress again before the March elections and has remained unsteady following a liquidity crunch in an offshore swap market frequently used by foreign banks trading in liras.